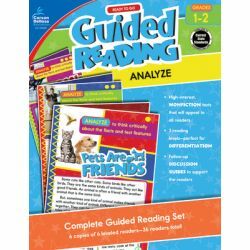 Strengthen foundational reading skills with a reading comprehension book tailored to help students at various reading levels. 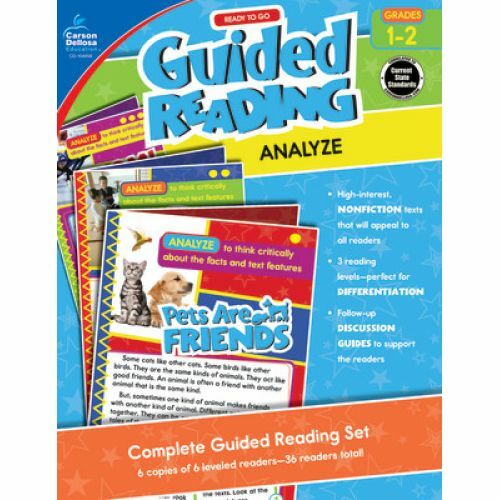 Guided Reading: Analyze for first and second grades makes lesson planning easier with six sets each of six nonfiction readers. There are 36 readers—two each for below-, on-, and above-level student readers. This teacher resource book helps engage students as they learn about Japan, zoos, pets, and more. The readers are separated into three readability levels and designed to keep students' attention. Various callout boxes direct students to apply guided reading strategies to the texts, such as scanning for meaning or word work. Each reader concludes with a writing prompt.